"Firstly I would like extend our gratitude on behalf of the partnership. You have been pivotal and instrumental from providing your consultancy to subsequently facilitating our management restructure, redundancy and subsequently coordinating our recruitment process to find us an ideal candidate. Your drive and enthusiasm is very clear from how you conduct yourself and how you provide services. Again a very big thank you for your help and we wish you every success in the future." "We had a great day with Patricia. She specifically helped us realise our many strengths, but also areas we need to improve on (with suggestions) and this was done in a supportive, team building way. We would recommend Patricia's facilitation to any practice that is preparing for change." "Patricia assisted us in holding a practice wide staff survey, which proved invaluable and led on to us commissioning Patricia to review the roles and responsibilities of our nursing team. Following this review we made the recommended changes within the team which have proven to be very successful." "Patricia facilitated a partners "away day" for our practice. We felt this was necessary as the practice was going through a period of change and needed to focus on a common approach. We found Patricia extremely facilitative. Her unique combination of patience, knowledge and understanding of the practice dynamics led to a very successful and enlightening day. Patricia demonstrated ability to handle and manage very different personalities. I feel we made lots of progress on the day and she also provided us with the necessary tools to continue in a more positive way. I would have no hesitation recommending Patricia as a mediator/facilitator. " "Patricia has been a great asset to the development of our practice. We were finding it hard to achieve our best despite all the hard work the whole team was putting in. Patricia came and spent a day at our practice and at the end provided us with a report of areas which she felt could be looked at to get the system working more efficiently and time effectively. She also guided us through the selection and interview process of our current practice manager which we partners found very useful, and felt very supported and guided throughout. We feel Patricia's experience in general practice, business and human resources has had a positive impact on our day to day running of the surgery and we would definitely recommend her services." "We have used outside facilitators to help with Partnership issues, to help with team building and on occasions to enable the whole team to be participative. Patricia Gray is ideally placed to take this role with her background as a Practice Manager and he in depth knowledge of how GPs work. As a team we benefitted enormously from Patricia's expertise." "Three years ago I was promoted to practice manager and had to take on a serious disciplinary matter. I had no experience in this area before and approached Patricia for advice and guidance on the process I needed to follow. The partners at the practice had used Patricia's services before in recruitment and were very impressed which is why the practice approached her again. Patricia was there every step of the way and also came out to visit me and with her help and support the whole process was conducted and completed successfully. I would not hesitate in contacting Patricia again as her help and experience was invaluable and gave me peace of mind at a very challenging time." "In 2011, we appointed a business manager to run our private urology practice and engaged Patricia to help with the recruitment. This was a new post. Patricia was invaluable to the appointment taking us through the creation of the job description, advertising the job, shortlisting and interviewing. Patricia was great to work with. She very quickly appreciated the type of person we were looking for and guided us very smoothly through shortlisting and interviewing. At every stage she provided the resource for advice that you need and gave that "other option" that is so important when appointing staff and is so much better provided by someone outside the organisation and looking at your business independently. We appointed a great manager who has now been with us 3 months. I would thoroughly recommend Patricia to anyone who wishes to make a similar appointment in their organisation." "We contacted Patricia as we had some serious management problems. She worked with us on these which resulted in a decision to appoint a new practice manager. She then helped us with the recruitment and interview process. As a result we now have a first rate practice manager and the whole process has been a great success." "Patricia led a very successful day for us in February 2011, in which doctors and managers reviewed key issues for the practice and developed strategies to deal with them. She put in a lot of work prior to the day to understand the special features of our practice and what issues were important to the individuals taking part. Her previous experience in General Practice helped to ensure that her contribution was focused and apposite. We came out of the day with a clear plan of what we wanted to achieve in the next 18 months, and a list of practical steps to help us to reach these goals. We would be happy to use her services again." "I was very relieved when Patricia started to help me with my HR problem. I had a difficult staff issue to deal with and Patricia was able to help take the emotion out of the situation and enable me to deal with it by referring to and implementing policies and procedures so that everyone knew where they stood. Patricia has also worked with the practice at a partners away day and whole team event also. She provides excellent support and advice by email, phone or in person. I feel much more confident knowing Patricia is able to advise me." "We had not previously used a facilitator for our planning sessions but the concept was recommended by local practice who had found the process very helpful. Some partners were initially reluctant but agreed to a facilitated meeting. Having Patricia as facilitator as the meeting enabled the doctors to recognise our own strengths and weaknesses, particularly from a management point of view, and to make business decisions that we all felt were appropriate and would help us to continue to achieve in the changing world of general practice. We all felt that we benefited from the facilitation and Patricia was able to engage even the most reluctant partners in the process……. We would be happy to use Patricia to facilitate other meetings as we came from the meeting with specific outcomes and had addressed the majority of our agenda. Many thanks." 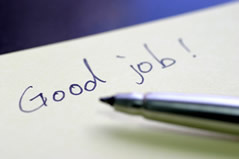 "The feedback from the staff following their "Customer Services and Communications" training was great, very positive. They loved the fact that Patricia had been a Practice Manager and so could relate to all the isues they had. They have asked if we could have her back to do another session later in the year, so I will ask the partners to consider this. All in all a job well done, many thanks." "Specialist advice given is always well thought through which gives huge confidence in very difficult situations. In particular, I praise the way issues can be discussed openly in a "no nonsense" way. I can express my preferred outcome and concerns and we work around that. However busy Patricia is and wherever she is working from she always makes time to answer calls, read and edit letters, what is necessary to support me. An invaluable HR service when the going gets tough!" "We invited Patricia to help us on two occasions. The first was to provide an opportunity for the partners and their new Practice Manager to build a business plan together and to provide a framework for the future running of the practice in terms of strategic thinking. This meeting also encompassed the decision whether to recruit a partner or a salaried GP. Patricia took us through some well thought out practical sessions that helped us formulate how we were to work together and plan for the future. " "On the second occasion we had a new partner, the senior partners of many years had retired and there were many changes across the practice in terms of ways of working. This time we held a Saturday session and invited all the staff. Once again Patricia used some practical sessions to break down barriers between the different staff members and improve communication. From this we moved on to a SWOT analysis where staff members and partners worked together on different aspects of the practice with the aim to improve access for patients." "At both sessions, we found Patricia was well prepared and offered a variety of ways that the sessions could be managed. At the sessions the techniques she applied to help break down barriers and improve communication were very helpful and apt for each occasion. We would use Patricia again to help us with our business planning." "The Bedfordshire and Hertfordshire Local Medical Committee have, for many years, used the expertise of Patricia Gray to enhance the education services provided to general practice by running a variety of Management Courses including Employment Law, Appraisals, Time Management, Recruitment and Retention, to name a few. Patricia is an excellent Facilitator, Trainer and Life-Coach who motivates and encourages individuals to fulfill their potential and achieve their objectives." "Our practice operates from two sites three miles apart, with a total of 11,800 patients. We have seven partners across the two sites. The partners asked for Patricia's expert advice to help the practice review its management structure earlier this year. Patricia spent a day in the practice, meeting members of staff with administrative duties and the practice manager to establish which roles the practices already had in place. Patricia's background in General Practice was very helpful as she has a good understanding of what is required in managed a practice successfully. The practice has a full time practice manager, but there was very little support for her to enable her to delegate tasks effectively. Patricia offered recommendations to develop a clear support structure for the practice manager, distinguishing clearly between operational and strategic duties. Patricia provided the partners with a detailed management review document for their perusal. The partners selected an option which they felt would work best for the practice. This would involve making one member of staff redundant. The partners and practice manager had never been through the redundancy process, and we felt that expert HR advice was crucial." "Patricia helped and guided us through this particularly difficult situation. The partners and practice manager felt secure in the knowledge that they had Patricia's support at every stage – in person, by telephone or by email – including drafting letters for us along the way. Her constant reassurance throughout enabled the practice to keep moving forward to develop its new structure." "During the past few months, the practice has made significant internal changes and has a new management structure having recruited an assistant practice manager. The practice will always be very grateful to Patricia for her time and expertise throughout its restructure. The partners and practice manager would have no hesitation in recommending Patricia to another practice. We will certainly seek her help and advice in the future regarding employment and HR issues."